Welcome to our page with current promos going on. Below you will find details. Clubbing tonight with group of friends? Concert or sporting event? Or maybe romantic dinner for two? Whatever your occasion is tonight, let Stretch Limousine, Inc. help by offering discounted rates for all stretch limousine point-to-point (from locaton A to location B and return from B to A) transfers. 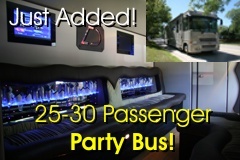 This special is very popular and we have limited number of limos available. On Fridays & Saturdays, this special is valid for all pick-ups between 7.30pm-10pm and returns anytime between 2am-4am. Call now 866-425-0976 for discounted rates & availability. Call 866-425-0976 toll free to book this special!